Heritage Skills Demonstrations | Lincoln Days Celebration, Inc. Enjoy a variety of demonstrations and displays of heritage skills during your time at the festival. Demonstrations last approximately one hour. Students from LaRue County’s 4-H Program will demonstrate the process of curing a traditional country ham. 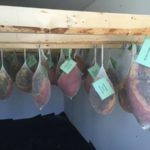 Learn how the ham is prepared, treated, seasoned, and cured in a “ham house”. Students will auction one of the two hams they prepared this year at the annual ham auction. Learn more about the 4-H Ham Auction at 11 a.m.
Robert Hutchins will be demonstrating chair caning at Lincoln Days. Hutchins has been caning chairs for more than forty years. Self-taught, Hutchins started caning when his wife inherited a child’s rocking chair with no seat. 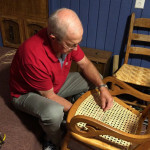 Hutchins has finished chairs for people in other counties—even other states. Weaving one strand of rattan at a time, he said caning the average chair takes from 8-10 hours. 11: 30 a.m. and 3 p.m.
Amber Gardner will demonstrate leather tooling twice on Saturday. She will be demonstrating how to cut, punch, and tool leather during the stages of creating and building a travel bag. 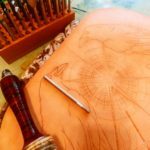 Amber will be using all hand tools, such as a mallet, maul, swivel knife, and hand punch to show the steps in creating a one-of-a-kind functional piece of art that will last a lifetime. Amber uses these same techniques and tools everyday in her workshop inside ArtGypsy.